Max Laniado is pleased to present Cosmina’s second solo exhibition at his New York gallery. This exclusive exhibition features her latest works, including her most recent collection “The External Facets of the Inner Self.” This collection is an exploration of the way in which the inner self is expressed through performances of external identity. Cosmina seeks to illustrate the transitional moment in which an entity, whether it be somebody or something, changes in behavior in accordance to specific situations. The fluid transitions between roles exhibit the various aspects of personality that are performed in order to socially survive. Cosmina is a French artist, born in Romania in 1968. Seeking to evolve her artistic voice, she studied the language of Chinese painting and practiced Japanese calligraphy. These elements are apparent in her compositions, which focus on the duality of the Yin and Yang: light and dark, empty and full. She seeks a harmonious balance that emphasizes the spiritual expression of the painting, creating colors that drive the spectator to mediation. 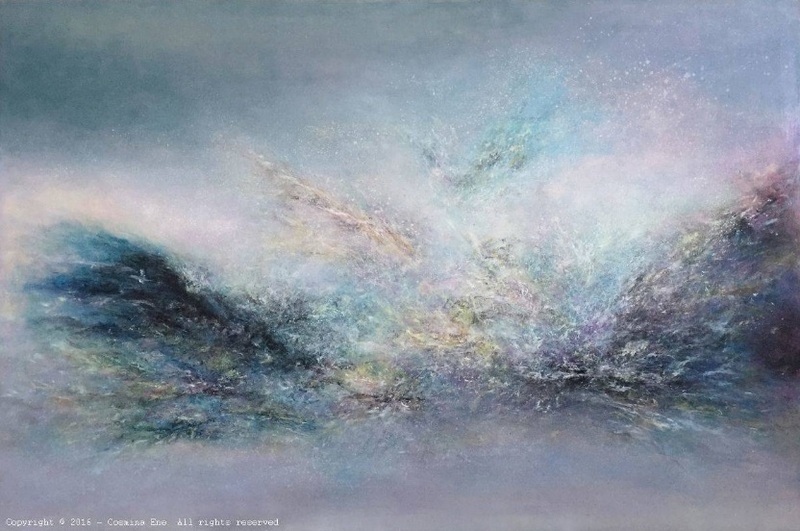 Described as “ethereal,” Cosmina’s meticulous brushstrokes dance across the canvas with boundless energy. 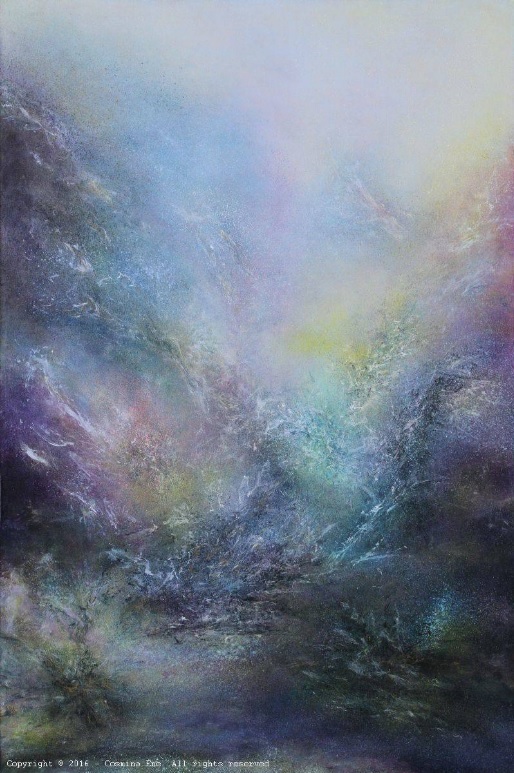 Through her unique and unclassifiable style of painting, Cosmina evokes cosmic and universal themes. The writings of Kandinsky and Klee led to the evolution of her personal style in which she reduces the shape-colors to its simplest expression: point and line. This is achieved through a method termed “controlled serendipitous painting.” The artist flings unpredictable flecks of paint upon the canvas while refining the creation with thoughtful detail during the process. 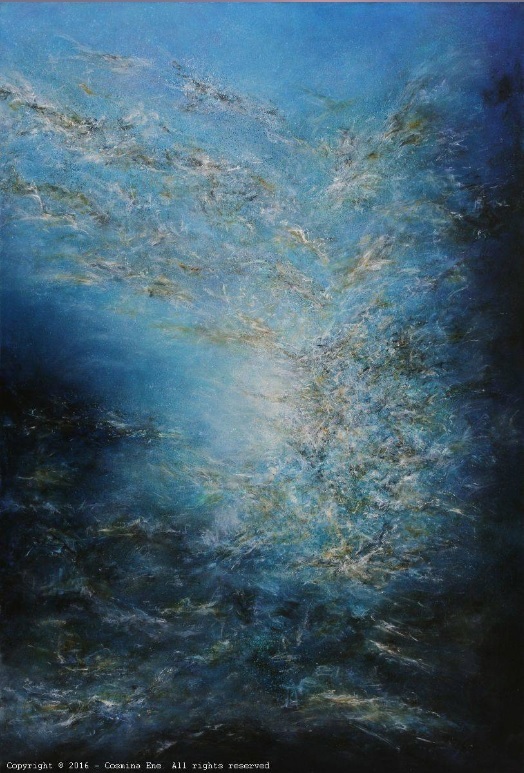 This technique allows the artist to work upon a canvas in a manner that is reflective of the spontaneous nature of the universe and expresses the complexity of the human mind. Deeply ingrained in the creative process, Cosmina continuously rotates the canvas while working on the floor, enabling her to enter into the painting deeply, both physically and mentally. This is also what the artist desires for the spectator: to allow one’s mind to go blank and immerse oneself in the colorful universe, as a way to awaken the senses. It is through this palpable breath of energy emanating from her brushstrokes that the artist challenges the spectator to explore the elusive concepts of the universe and meditate on the existential quandaries of human life. For almost 20 years, Max Laniado has promoted exclusive artists in London, Paris, and New York. Max Laniado discovered Cosmina in 1999. Since then, Cosmina has had 12 solo exhibitions in Paris and New York, and participated in over 50 group shows and 12 art fairs (8 international). Experts, art critics, and collectors around the world recognize Cosmina as a potential ascending master of the 21st century contemporary art world. Cosmina is a French artist born in 1968 in Bucharest (Romania). Due to the Ceausescu regime she and her family exiled to France. As early as eight years old, she started to learn painting. She was encouraged to paint by contemporary masters. She took many trips around the world; thus, she enriched her imagination through the cultural varieties and was influenced by different artistic movements. the greatest Japanese masters. She then settled in New York, and was exposed to artworks by renowned American contemporary artists. In London, 1999, Cosmina was discovered by Max Laniado, promoter and patron of artists. He noticed her great talent. He encouraged and supported her in the improvement of her art, generating immediate recognition. In 2004, he presented her first abstract paintings in major international art shows creating immediate recognition. two solo shows in the USA. 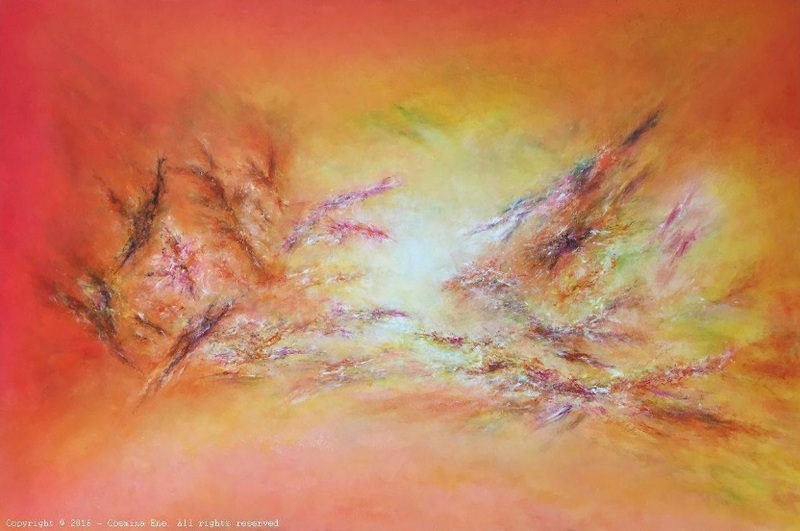 work led these experts to create a new art movement they called “Atmospheric Abstraction”. Max Laniado distributes her works in worldwide exclusivity. and light: she transcribes these with spontaneous brush strokes, meticulous, well-dosed touches of paint, and striking colors. uncontrollable concept of human nature: ‘time’. to try and expose the real hidden quintessence. with her new collection "The lights of hope". 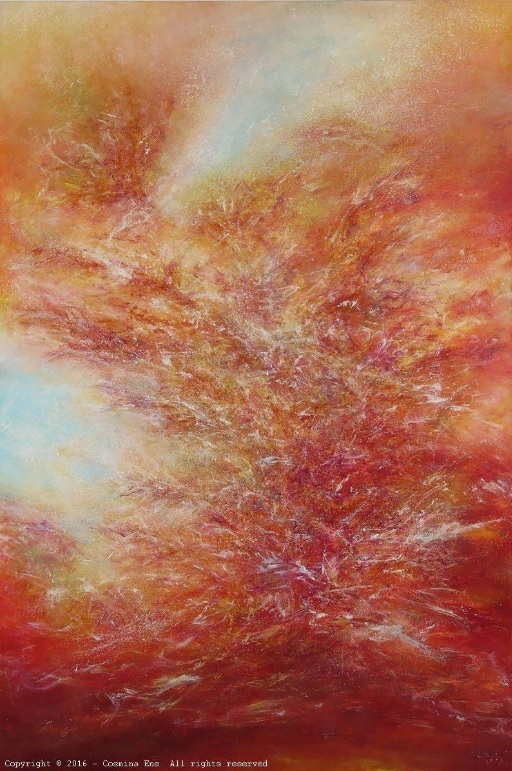 Cosmina's paintings combines a vital energy and brings us back to the essence of humanity. I First met Max Laniado and was invited to his gallery by him directly after being given reference from his interns and associates I assume as I get the feeling Max is truly and only interested in the well being of his artists and not in spending his valuable time making new friends on the worldwide web. Leave that up to the new millenials. I liked him immediately although my overactive imagination kept saying he may be a French Vampire who might turn into a bat at any moment snd fly off through the Chelsea skys singing a song about love and enchantment. He told me about his gallery and the artists he had been working with. they know what art is. Regardless art in my opinion cant be classifeid or roped in with cliches or categorical names like realism or abstraction or surealism, although we work within this structure to try to describe what is mostly undescribable. Especially if its real and truthful art. Living with it can enhance or completely destroy everything you may have learned up to this point. either way art can change your life. Its gods universal personal minstrel show. Cosmina moved around the 2000 Sq foot gallery like she was floating. I could swear I was in the presence of a living ghost an ethereal force that was doing her best to be cordial and relate to the people. A creature who could summon the power of the universe within her tiny little hand. Pretty impressive for a lady who soaking wet might weigh 110 pounds. TNYO: Cosmina where are you from? Cosmina: I was born in Romania. I have lived in France for 34 years. I am a French citizen. I graduated in Japanese language and civilizations and I have lived for one year in Japan. Two years ago, I moved to the United States where I live and work now. I am a very international person. Cosmina: ​For me, creating images with colors is the most efficient way to communicate and express my feelings. My painting style was built little by little by my personal life experience. Born in Europe and raised up in France, I was initiated into oil painting at the early age of 8 years old. Since then, I have always used oil paintings on linen canvases to create my works. This medium has been the most used by European painters for many centuries. I think it is the most durable and nicest to work with. Since I’ve moved to the United States I have noticed that the way the Americans express themselves is more dramatic and more theatrical than the Europeans. This encourages me to think more about the various aspects of the Inner Self. TNYO: You are kind, sweet and accommodating; does the public get you and understand you? and to try to understand what you are doing? Cosmina: I truly believe that traditional art does not need any explanations. I am not against conceptual art. It is just too easy for my personal satisfaction. The comprehension of an artwork is very complex process and I am aware that the understanding depends on the level of sensibility and art education. Most of the art lovers understand my work and “feel” something in front of my paintings. I do not expect everybody to love my artworks and I am always happy to guide those who need to be initiated into art. TNYO: I was very impressed by your explanation of your process. as you mentioned you approach the canvas and begin to work external stimulation, no music just silence. And as I took in your work I could hear sound like crashing meteors or speeding aircraft breaking the sound barrier again and again. Cosmina: I studied the Japanese calligraphy and my teacher used to say: ”The instant the brush first comes into contact with the paper, reveals the state of mind of the calligrapher.” For that reason I do not want to be disturbed when I paint. It’s very enjoyable to reach this moment when I create without thinking, when my hand is not any more under the control of my mind. I like to use in my canvas oriental compositions, inspirited from Chinese landscapes paintings, where the duality between empty and full, yin and yang - light and dark - plays a key role. A successful composition must be a space appropriate for meditation. The graphics in my paintings are reduced to its simplest expression, dots and small lines. I have chosen this graphical approach after reading Wassily Kandinsky’s and Paul Klee’s writings about art. These "color-forms" are basically directional indications whose role is to convey spectators to express their emotions. The lack of any “object” suggestion reinforces the idea of ​​something that does not need words, something that doesn’t need to be described or expressed but need to be felt. I adopted Jackson Pollock’s "action painting". These unforeseen and unforeseeable dots thrown at random on the canvas are a very efficient way to release the most hidden emotions in us. It's also a way to express the infinite complexity of human thoughts and unpredictability of human feelings. Painting on the floor gives me the feeling of participating physically and mentally in the construction of my canvas as the Japanese calligraphers. I like to feel overwhelmed, attracted by colors and directed by lines; I love this trip "into" the painting. I would like the viewers to experience this feeling and dive into their emotions. My painting experience is thus essentially based on the relationship established between the viewer and my canvas. I am not interested by the relational power established between the "color-forms" and the pictorial space, but by the "emotional experience" aroused to spectators. TNYO: Your palette is consistent, is this school taught technique, a gallery requisite or personal preference. Cosmina: My palette is a personal choice. I have studied Wassily Kandinsky’s and Joseph Albers’ colors theories and I believe that colors should express the feelings you want to reach. I always try to restrain my palette to one or two colors combined with white and black. Too many colors are distracting and disturbing. I love the blue. It’s calming and suitable for meditation. TNYO: Thank you for the hand signed book. It’s beautiful, are you happy with the show? One year for was it 12 paintings? Cosmina: I had a great pleasure creating my recent collection and I hope that the public will appreciate my work. I am not interested in finishing a painting or in creating a large number of paintings. I love to explore the process of creation. In each canvas, I want to go further and deeper into the creating process. In order to create a collection, I try to find a concept allowing me various interpretations into 10 or 12 paintings. TNYO: The External Facets of the Inner Self - what does this mean and does it mean to you? Cosmina: The “Inner Self” is what you really are. The “external facets” are the different aspects you want to show or you have to adopt in order to socially survive. A person changes its behaviors according to different situations. A man, for instance, adopts in public different traits of mind and behaviors according to the roles he has to assume. In his private life, he is a husband, a father, a lover. Professionally, a man can be a politician, a butcher or a worker. To socially survive, a person shows different aspects of its personality. Those changes have become so natural that nobody pays attention to them anymore. This is the reason why I created this collection. Cosmina: I love Andrea Bocelli. I will go with Andrea Bocelli and Noa. “Life is beautiful this way”. Smile without a reason why. Love as if you were a child….